Carrie Mae Weems was born and raised in Portland, Oregon. She is known for works that forcefully combine engaging narrative and provocative humor in formally beautiful images. Her photographs and videos intertwine personal experience, African American folklore, history, and politics. 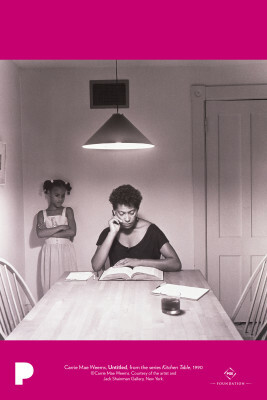 In her 1990 Kitchen Table series, Weems creates a dramatic stage: a small room with a table and a single overhead light. The photographs portray a woman sorting out the difficulties and conflicts of her life in a search for personal knowledge. Sometimes she is alone; at other times, she appears with a girl, a man, or two women in images that suggest mother/daughter relationships, the power dynamics between lovers, and the intimacy of conversations between friends. Though the character is fictional, Weems used herself as the model and shot the photographs in her own kitchen. The photograph reproduced here is the first in a triptych, a grouping of three images. Each image portrays the woman and the girl in a different position around the table. Weems lives and works in Syracuse, New York. Describe the figures in this photograph. How are their bodies positioned? What are the expressions on their faces? What do you think is the relationship between them? What evidence from the photo suggests that relationship? Examine the objects in the room as clues in a story. Where are the woman and girl? What has happened just before this moment? What will happen next? Pick one person the image and write down a few sentences that describe how that person feels. Now swap roles and describe how the other person feels. What would the woman and the girl say to each other? Write a dialogue for them. Expand that dialogue into a scene in a play, film, or short story. Analyze the image’s composition, or arrangement of individual elements. How are the figures and objects placed in relation to each other? Where do the lines in the image direct your gaze? Is the composition symmetrical? Identify details in the image that support your response. How does the composition contribute to the meaning of the work? Consider Weems’ use of light and shadow. What is the effect of placing the single, bright bulb, directly above the woman? Why do you think Weems shoots photographs in black and white? How would this work change if it were in color? Photograph a reconstruction or reenactment of an important moment in your own personal or family history, using friends or classmates as models. Tell the story in a text that accompanies the work. How does reenacting the event change your understanding of that moment in your own history? How do personal histories or social histories affect the present?